When? 1996 | Where? Amazon Video, DVD. In the world of film, the genre of crime covers a broad array of movies. From the stark and morally ambigoius world of noir, to the action-packed heist movies, to big-budget thriller, the world of cops and robbers is pretty well represented on the silver screen. But one such subgenre is overlooked, and is easily one of favorites. Crime films set in the West, and Texas specifically have their own unique draw. Call it, Boarder Noir, if you will. It’s a genre that mashes together the hard-bitten bleakness of noir set in big cities like New York and Chicago, but sets against the arid backdrop of the West. Films like the Cohen brothers’ Blood Simple and No Country For Old Men are two such examples that come to mind. 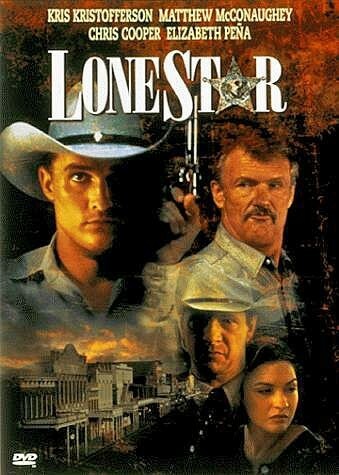 But one of the best examples of the blending of noir and the cowboy Western esthetic is 1996’s Lone Star. Directed by writer, director, and novelist John Sales, Lone Star tells the story of Sam Deeds (Chris Cooper), the sheriff of a small Texas town along the border. Deeds lives in the shadow of his late father (played by a young Mathew McCaughey in flashbacks), the town’s beloved former sheriff. When Deeds finds the skeleton of Charlie Wade (Kris Kristofferson), a corrupt former sheriff who mysteriously disappeared before his father took his place, the younger Deeds sets off on a quest to find out whether his father was involved, a journey that causes him to confront the town’s complex and dark past as well as the secrets his lionized father kept hidden from him. I SHOT THE SHERIFF : Chris Cooper plays a small-town Texas sheriff trying to unravel an old murder and his own fraught past in 1996’s Lone Star. The film skips between several characters outside of Deeds, as well as timelines. While the plot is, at its heart, about solving a mystery, it weaves in Texas’ fraught history with racism and xenophobia, particularly toward Mexican immigrants and African-Americans. The experience of watching the film is almost like reading a well-written novel, and highlights Sales’ storytelling ability. It also doesn’t hurt that the movie has a fantastic cast, with the late Elizabeth Pena and Frances McDormand rounding out the stellar trio of Cooper, McCaughey, and Kristofferson.